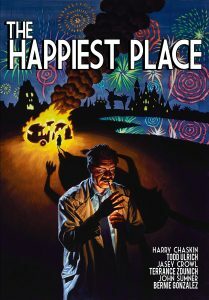 Security guard Miles Manning has one thumb and one job– To keep the riff-raff out of Garveyland, the Happiest Theme Park in the World. But when Miles’ former mentor is mysteriously murdered, he decides to do some real detective work and get to the bottom of it. After all, he’s got a badge… even if it has a cartoon rabbit on it. 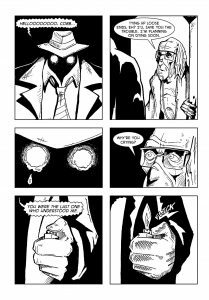 Miles’ quest for answers draws him deep into the seedy underbelly that lurks (quite literally) beneath the park, ultimately uncovering a conspiracy that threatens his very existence. If Miles is to survive, he’ll have to face his own demons and answer the hardest question of all: Is he a company man, an artist, or a murderer? Welcome to Garveyland, the happiest place on earth… may God have mercy on your soul. You’ve been to one of the big theme parks before, right? Disneyland. Six Flags. Universal Studios. All of the sights, sounds, and smells that could possibly be associated with fun incarnate, for the modest sum of a day pass at the entry gate. The people who work there know that a lot of what goes on is an illusion. A protected illusion that the cast members (not employees) get to peek behind in order to handle the day to day operations of the park itself. The first illusion is that there are no customers, only “guests”. The second is that all of that fun and excitement comes easily or naturally. If you’ve ever had to clean up a spill of popcorn, cotton candy, and vomit, you know that there’s nothing natural about it. Miles Manning knows. He’s an undercover security guard… sorry, that’s “plainclothes guest liaison”… working the mean streets of Garveyland, and he’s seen things. Scary things. Things that would make you swear off of animated bunny rabbits for life. In this park, nothing is what you think it is. 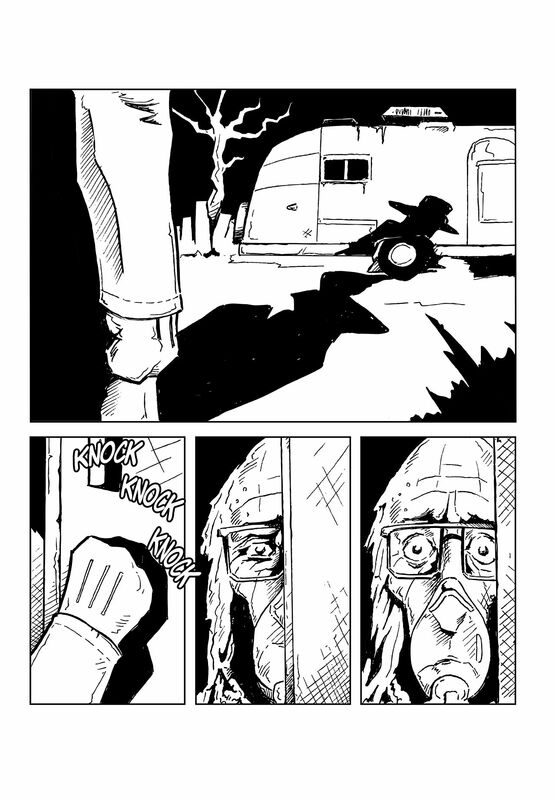 So there I am the other day, sitting at my desk when an email pops up through thePullbox, from Harry Chaskin. He’s written a graphic novel, a dark bit of noir about life working at a theme park, and is looking to get the word out. It’s all about Miles, a man on the back end of middle age, who sees the illusion for what it is in all its shapes and forms. He used to have hopes and dreams but is now left with habits and a job he takes pride in (not the same as loving it). He’s determined to live his life as close to the heart of Garvey Land as he can, unable to totally let go of past ambitions and knowing full well that what he really craves is just beyond his reach. 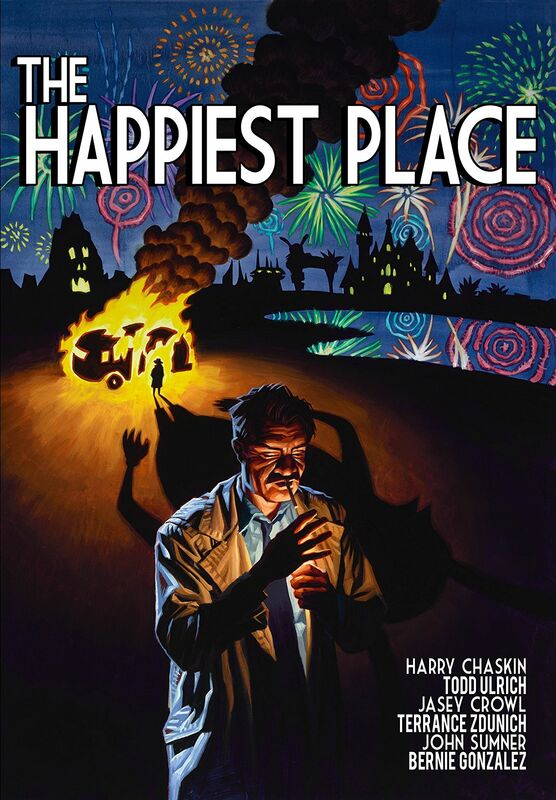 Harry Chaskin has done an outstanding job of showing a slice of life from the eyes of a man whose world has gone gray. 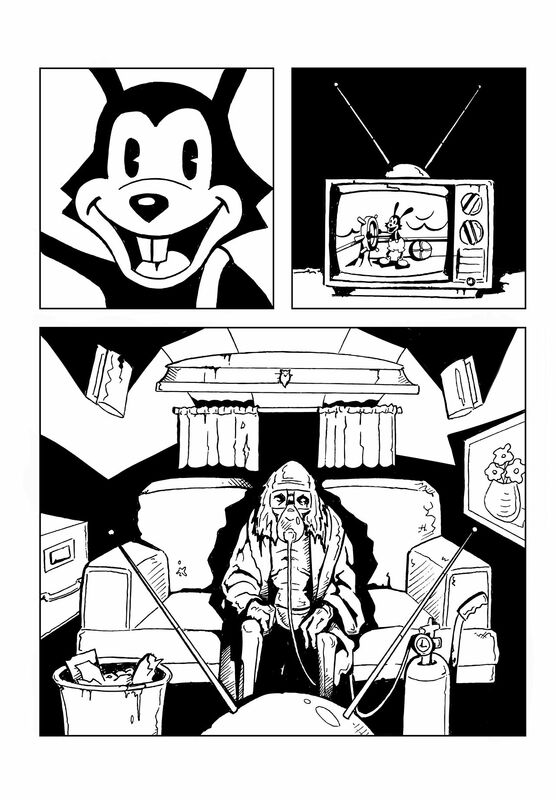 Like any good pulp-noir graphic novel should be, The Happiest Place makes full use of black and white as a fully functioning part of the storytelling. Each chapter employs the talents of a different artist, each with his own unique take on the book’s visual style. Bookending the effort is Harry Chaskin himself, bringing a lot of experience to the page with credits working for Disney, Adult Swim, Warner Bros. among others. The rest of the story is rounded out with some great work from Todd Ulrich, Jasey Crowl, Terrance Zdunich, John Sumner, & Bernie Gonzalez. Each of these artists employs their own style, and they all bring something unique to the table in telling Miles Manning’s tale. If they do have one thing in common, it’s that every one of them is able to convey a lonely life full of awkward and uncomfortable moments. 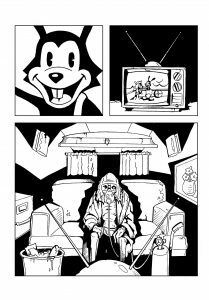 And make no mistake at all… contrary to its name, The Happiest Place is full of uncomfortable, slightly left of center, often cringe inducing moments on the page. If you never would have imagined a dark dystopian story about life behind the scenes at one of the big amusement parks, you haven’t worked at one. Without giving too much away, let me just leave you with a warning… Whatever you think might be going on between the pages of The Happiest Place, there’s a pretty good chance that you’re wrong. Give it a shot. I dare ya.